March is Red Cross month. Did you know that? The Red Cross operates locally, nationally and internationally... and when all else fails you, it's often the Red Cross that will come to your aid. Be sure to support them, so that when you need it, they can support you. In honor of Red Cross Month, the www.Facebook.com/LeesburgVa fan page has added the Leesburg blood drive locations this month on their Events page. Can you think of a simpler way to save 3 lives and get cookies? I can't. 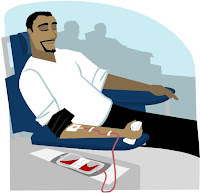 Make time to donate blood today!